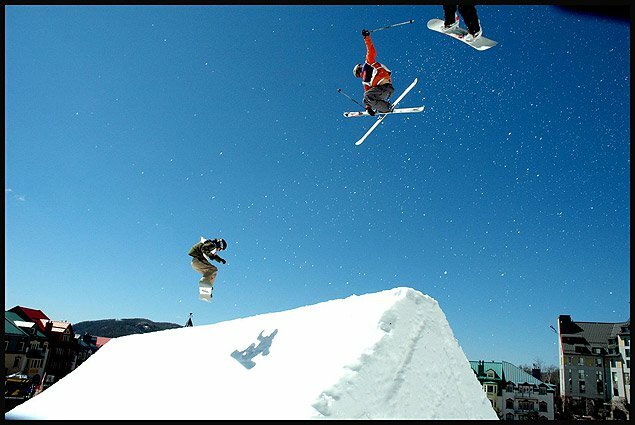 Words &amp; Photos: Julien Heon Mont-Tremblant, Quebec, - Tremblant launched the fourth edition of it’s Spin Symposium last weekend with skiercross and boarder cross competitions. In the 10 days of festivities, the famous urban job competition was scheduled, as always, for Wednesday night. It’s with the crew of New Way Productions that I enjoyed this year’s happenings. Half the crew was invited, but another half had to compete in the Qualifications to earn their lucky spot among the best jibbers around. J-D Zicat, David Beaulieu and Guyaume St-Cyr were the ones that had previously proved their ability to ski the famous course that winds it’s way down Tremblant’s pedestrian village, so it was up to Justin Meilleur and Sam Robichaud to join them during qualifications Tuesday morning. Unfortunately for Sam, the set up, a rainbow box and an up rail, did not allow him to dial in his winning trick, the Robio. 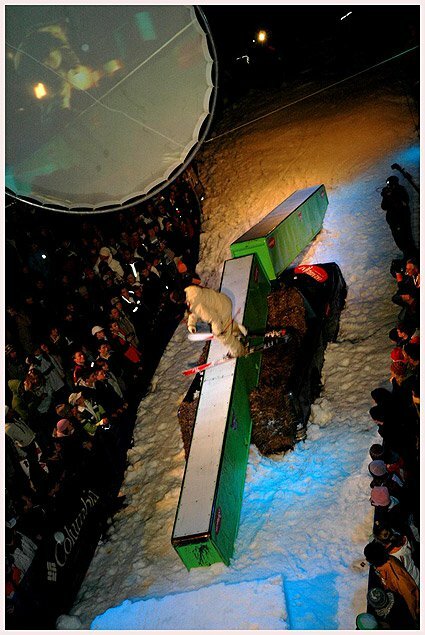 Whether “Robio-ing” in, out, or doing his Robio switch up, it was just impossible to showcase the trick he made famous last summer on the Blackcomb Glacier. Justin Meilleur on his side easily won the Qualifications, which with the rain, were just too long. The weather not being nice enough to shoot some park or anything, the skiers of New Way were invited to take part in some TV interviews with RDS (French sports network). So the ski stars were TV stars for a moment, and we all played the game. Luckily enough, the rain turned to snow Tuesday night, and kept falling until late Wednesday night. We had also wanted to shoot that day too, but the idea went away with the weather and the need to recover from the party of the last couple days. Later in the afternoon, the athletes started to show up. 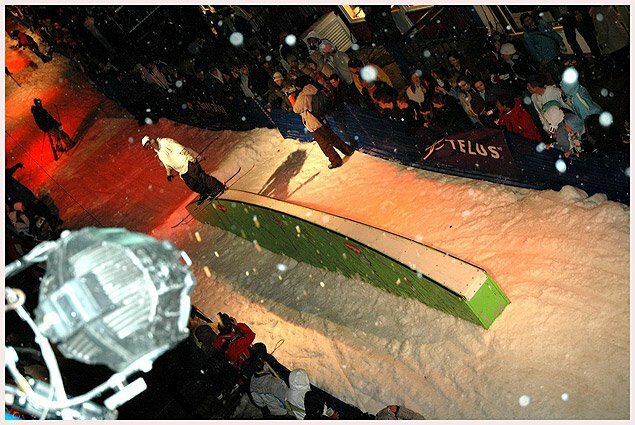 Among the invited were: David Beaulieu, Andy Stewart, Alex lallier ( winner of last year’s edition), Andrew Brett (winner of Axis Slopestyle’s rail jam), Hugo Pelletier, Guyaume St-cyr, Alexis Godbout, Phil Casabon (winner of Axis Slopestyle and Coté Obscur) and Jean Denis Zicat. The setup consisted of a down rail, a rainbow box, and 2 boxes mounted on an old pick Up truck to make a Up-Gap- Down. The snow was certainly sticky, and a lot of riders, not to say everyone, had a little bit of trouble. Jean Denis Zicat took some initiative and started spinning on and off the down rail, and switching it up on the rainbow box, cranking up the other riders in attendance. Justin Meilleur who had won the qualifications also had some very solid and technical runs, with perfect 270 in, switch up, 270 off the down rail. In the second part of the final, JD really took the big arsenal out and killed it on almost every run he did. Zicat stomped some of the most perfect 450 in 270 out seen that night, and consistency is the word that best describes his performance. He did not let anyone doubt the fact that he was the one bringing home the big checks and took both the $3000 winning check and the $500$ best trick check back to the condo, along with 2 cell phones, some beer and some Columbia outerwear. Alex Lallier also had some very nice skiing that night, and JD shared a big Coors light with him. Zicat respected the rule, and shared his winning in the after jam party going on in the Caribou, making sure everyone who supported him had a good night in one of the world’s best ski town bars. The Mcdonald’s I’m Lovin it Spine Contest was held on Saturday night, a gigantic Spine of 90 feet long and 25 feet high was built at the base of the south side. Seven invited teams plus 1 team that won the qualifications held on Friday were participating in this one of a kind competition. 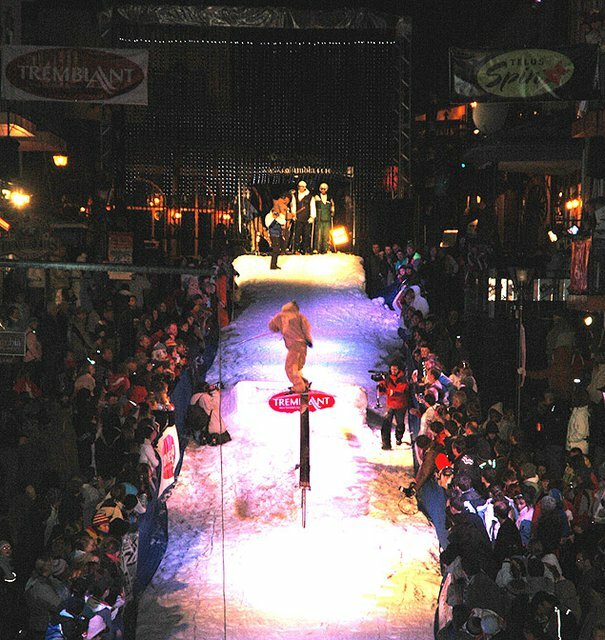 Teams of 4, 2 skiers and 2 snowboarders had to perform a choreographed run, all 4 jumping together. 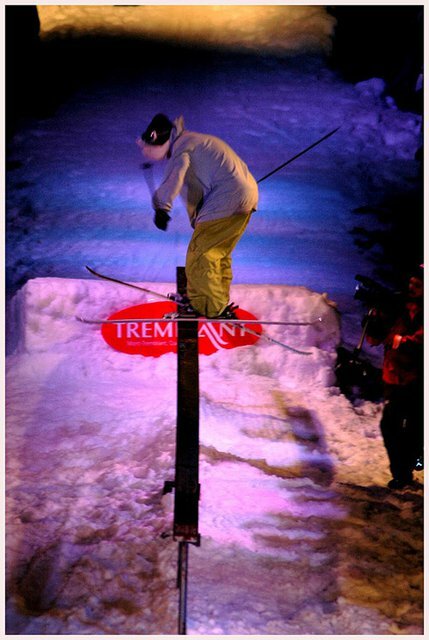 The All-Stars Tremblant team won the big final with a total prize money of $5000 cash and 1 plane ticket per team member. We took the Wet's bigger brother for a spin and this is what we thought.